The music for this CD was specially created with the S.O.L.F.A. frequencies. When combined with the intent inherent within the ancient solfa syllables, a powerful force for higher consciousness and bioenergetic balance is possible. The music creates a meditative state that is excellent for use by sound, hypnosis, and massage therapists. 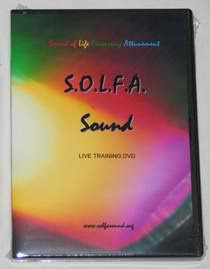 This CD extends the S.O.L.F.A Frequencies into higher states of consciousness...chakras 8-12. The music is melodic and transforming. This CD is for those who know there is more and want to awaken the higher self into experiential insight. This DVD is a basic introduction to hands-on tuning fork therapy. Also introduced is energy perception, pendulum dowsing of the chakras, and color therapy for balancing the chakras.This is a great visual tool for learning how to work with the energy centers and aura of the body. Within the United States: $20 purchase = $4 shipping; $20.01 to $199 = $6.00 shipping; $200 and up = free shipping.